PME Politics: Updated GE2017 Forecast - Conservative Majority of 116. Updated GE2017 Forecast - Conservative Majority of 116. Today saw the release of two further polls with field dates of 28th April. Both had the Conservatives well ahead (again), though there is some evidence of a narrowing in their lead over the past few days - back to similar levels as we were seeing at the beginning of the campaign. Conservatives 383, Labour 183, Lib Dems 7, UKIP 0, SNP 55, Plaid 3, Greens 1. The 'polls plus' model was updated today to include a bespoke swing adjustment parameter for Scotland. This new mechanism is based on the latest available Scottish polls ( Survation and Panelbase: April 21st, and YouGov: April 27th), and the 2016 Scottish Parliament results. It hopefully gives the 'polls plus' model a better assessment of how swings are behaving in Scotland, which with the added dynamics of the SNP (vote share previously not modeled) and the independence question, we should expect to be quite different than in England and Wales. It also updates new locations where parties are standing down in favour of incumbents/main challengers - this time UKIP in the South West for the Conservatives. When applying the 'polls plus' model (with the new Scottish swing parameters), the result did change somewhat, but the total Conservative seat projection remained the same. The 'polls plus' model moves the Liberal Democrats up by 5 seats, Plaid and Labour up by 1, and the SNP down by 7. Overall, the Conservatives (if this projection were to be correct) would sit on a Commons majority of 116 seats. The updated projection tracker graph shows the Conservatives maintaining steady in their seat projection, a long way ahead of the Labour party (who do however move up to their highest point yet in the projections). According to the polls plus model, the Conservatives are indeed set to take Moray with about a 3% margin from SNP Westminster leader Angus Robertson (a result suggested by YouGov's analysis of their recent Scottish poll). In fact, the model predicts the Conservatives will take 5 seats in Scotland from the SNP, adding to their solitary win in 2015 (Dumfriesshire, Clydesdale and Tweeddale). This would be hugely significant for the Conservatices, cementing their position as the SNP's main challengers in Scotland, increasingly pushing Scottish Labour to the fringes, and taking a 'scalp' to boot in the form of the SNP's leader at Westminster. The table below shows current projected Conservative Party wins in Scotland. The polls plus model increases Conservative wins in Scotland, but projects some losses to the Liberal Democrats in England (hence their overall seat projection does not move between the two). A new regular feature of the forecast will be showing the line at which new marginals between Labour and the Conservatives would be formed, according to the forecast. In short, each forecast will show the 6 most marginal battlegrounds between the country's two largest parties, according to the projected overall results. This line currently sits between Gower (Conservatives, 27 vote majority) and City of Chester (Labour, 93 vote majority). According to today's forecast the margin would move deep into Labour territory: between Bury South and Wirral South, both of which were won by Labour with around about a 10% margin in 2015. Crucially, and perhaps indicative of the kind of the night that the Conservatives are projected to have, the model is currently forecasting the Conservatives to win in Tooting - current London Mayor Sadiq Khan's old Commons seat. A word of caution should be made at this point - though the projections are expected to give an accurate overall picture, I would urge caution when reading into constituency-level predictions. There are a huge amount of local factors which can always sway the result here or there which it is impossible to control for in a model such as this. 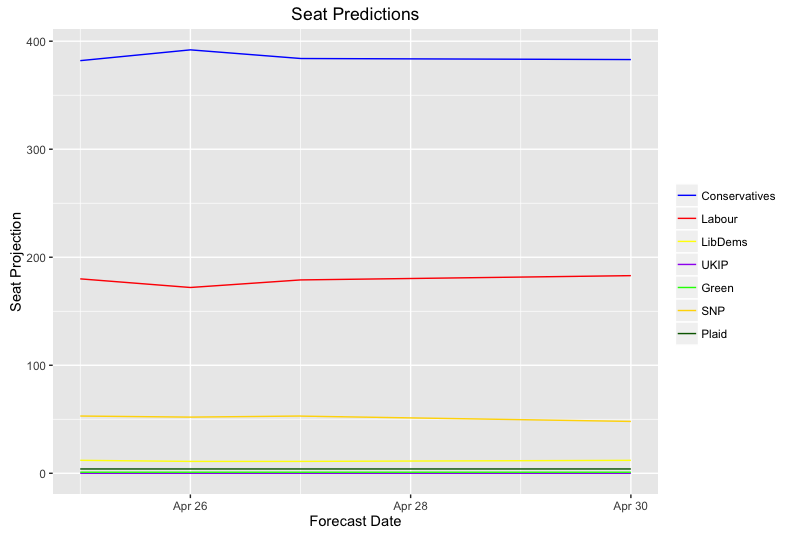 Think of individual seat predictions as more informative of the kind of nationwide result that the model is projecting, rather than actually trying to make a call in each seat. In other words: don't put money on the Conservatives taking Tooting. But if they did, it the Conservatives would be well on their way to a 100+ margin.